Come Celebrate Valentines Day in North Myrtle Beach! 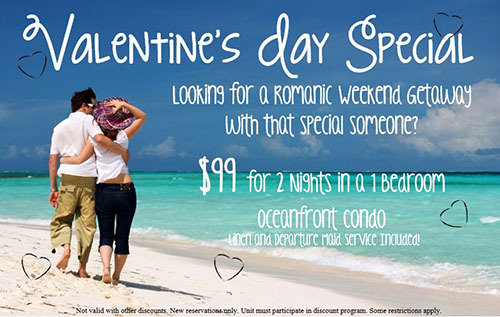 Treat yourself and your special someone to a Valentines Day Weekend getaway at the beach! Booking a long weekend in one of the best beach vacation destinations is a perfect way to let your special someone know how much they mean to you this Valentine’s Day. February in Myrtle Beach is quite a bit less crowded, but it is still filled with and events to keep you entertained during your visit, especially during Valentine’s weekend. Enjoy a romantic dinner at one of the Myrtle Beach restaurants, enjoy a day on the golf course (for those that golf! ), and stroll down the boardwalk to people watch or enjoy some off season window shopping. Any thing that you choose to do will make for an enjoyable, relaxing Valentine's getaway for you and your special someone. Please refer to promo code VAL when making your reservation! Don't forget to book your summer vacation with us as well! We have a wide range of properties from 1-4 Bedroom Oceanfront Condos, to 8 Bedroom Oceanfront homes and Channel Homes as well. Call us today at 888-669-7853 and ask how to receive $75 off your vacation rental! Trust your vacation to the Experts.